#CourtsMatter: From the local courtrooms in your community to the Supreme Court in Washington, what happens in and comes out of our court system is important to our lives and our very democratic way of life. All too often, however, the courts are used as political arena in a dangerous way and Donald Trump’s administration only exacerbates that problem. As a candidate and as president, Trump has made direct attacks on the judiciary with his tweets, statements, and nominations. 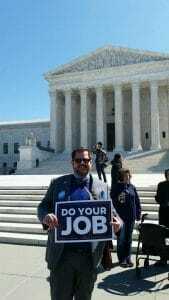 ADA is an active member of the Why Courts Matter coalition that is educating and lobbying on this subject and will continue to stay active to ensure that we have a fair and functioning judicial system.